There is so much information about the Shimano Nexus INTER-8 hub that the page is split into two parts. We´ll start with general information about all of the INTER-8 internally geared hubs. The second part contains information about the Roller Brake (SG-8R…) and the Coaster Brake (SG-8C…) models. Cesur Bikes offers a LED light for the INTER-8 turning shifter. The power for the LED is generated by the necessary hub dynamo. If bicycle lights with a “stand light function” (condensator) are used the shifter LED light also shines during stand the stand still of the wheels! Here is a picture of Bob Carter´s oil bath running Nexus hub. If you’re looking to purchase the Inter-8 you can find the coaster brake version here and the roller brake version here for competitive prices at our partner’s website eBikeStop.com. You can also find the coaster brake version at Amazon here and the roller brake version here . does anyone know if it’s possible to combine nexus parts to construct a nexus 8 with redband needle bearings and a coaster brake? Yes, I would like to know if a redband, needle bearing hub can be built with a coaster brake. The inner gear units with the needle bearings is not signed as compatible! Can you please tell me the difference between 8R25,8R27,8R30 and 8R35.I do commute a lot.So which is more recommended and offers better value for money? some of them havent even showed up on other Shimano Websites? Does that mean that they are the latest models ? Is this a new design or something that has been available for some time? the Amsterdam shows a SRAM 7-speed hub and shifter. Would like to know what to do for everyday maintenance for my Shimano Nexus hub gear. I’m just an everyday cyclist.Also, how do I unhitch gears when removing rear wheel? How I would love to have an answer since your question is my own. Essentially I have been repeatedly assured by those who know that there is no maintenance either needed or even possible in the unit since it is sealed. I take seriously the thought that even so I wd like to grease the workings but have neither the tools nor the expertise to dismantle the hub. I have used mine every day for three years now without a hitch – except when I have removed the rear wheel and replaced it. By revolving the heavily sprung gear unit against the spring and finding ways to hold it in position I get enough slack to manipulate the nut on the end of the cable which fits into the space – though I have to use a flat-end screwdriver to ease it from its place. Replacing it is a similar issue: you have to find ways of keeping the unit in its taut position so that the cable is long enough to be manipulated into place again. It is such a relief when I get it done that I am prepared to cope with assorted misalliances and slippings which occur in gear-changing – because I have upset something. I am unable to line up the two little red dots in 4th gear, as recommended, and have to compromise. It`s possible to find amateur videos on “You Tube” which clearly show how to remove and replace the rear wheel, and also how to adjust the gears. I often make use of these videos, as my memory isn`t as good as it used to be! As for maintenance, Shimano have produced an oil called WB maintenance oil, which has the same properties as hub grease, but which penetrates the innards more effectively. Google “Shimano WB maintenance oil” to find a page with instructions. Doesn`t require much dismantling, but you`ll need 22mm and 17mm cone spanners. Lubricating about once a year will surely prolong the life of the gear. NEXUS 8 SG 8R30 – CHIEDO CORTESEMENTE UN CONSIGLIO – QUANDO PEDALO SUCCEDE CHE L’INGRANAGGIO DEL MOZZO NON INGRANA BENE, CIO’ CAPITA SPESSA ED E’ MOLTO FASTIDIOSO. Can I buy an 8 speed system that will replace a 3 speed system on an old sears trike, factory direct? How much? If not factory direct where is the nearest distributer/dealer to Portland? What is the suggested retail price? If anybody can hel me, I´ll need a good online store where to buy a same hub. thank you. Individuals like you make the Universe enjoyful, sharing wisdom. If you still need help email me, I’ve figured it out after two days of messing with it. it’s very tricky, but I took pics of each step. I disassmbled the hub axle unit. Now I can’t bring the pieces together. Can you send me your discription or pictures? Is some material online? What exactly did you disassemble? Did the return spring come loose? Are there perhaps any pictures? For any further disassembly you are unlikely to find any manuals or tools. I have the same problem with the Hub Axle Unit and haven’t got a clue how to put it back together. Would you be so kond and send me your instructions. I know it is 3 years ago – but could you possibly e-mail me the pictures of the Axle unit assembly that you worked out. I have just spent the last 3 days trying to work it out without success. The shop engineer doesn’t know either! I need my bike to commute next Tuesday too. thank you, RS. My problem is the same, my email “ffparrales@gruposolucion.es”. thanks. Does anyone know what the “Maintenance Oil” used on the Nexus 8-speed is? Is it an actual lubricant, or is it a solvent to remove the grease? WB maintenance oil is a lubricating oil with the same properties as internal hub grease, but as it is in liquid form, it penetrates the hub innards more effectively. Can also be used with coaster brakes (remove the brake before dipping the hub in the oil!). Google “Shimano WB maintenance oil” to find a page with instructions for use. Can I use a smaller front gear (like 32T instead of 44T) with a Nexus 8, or will this exceed the acceptable input torque of the gearhub? Does Shimano publish the acceptable input torque? I have the same general question. I note that Rohloff and Sram have published limits for their hubs input ratios. Sram’s vary from 1.73 to 1 upto 2.0 to 1 depending on hub model. Rohloff lists a limit of between 2.35 and 2.50 to 1 depending on application and/or rider weight. Even older, pre Sunrace, Sturmey Archer enginering data I found shows a input ratio limit of >2.0 to 1 for the two hubs I have found data for. No published data has been found for either Shimano or current Sunrace Sturmey Archer hubs. Interesting that the western owned companies provide the information but the far eastern owned ones do not. is the non-drive “end” of the hub shell replaceable? By that, I mean the splined part that attaches the brake system, which holds the left-sid bearings. My customer rode his wheel loose (while attached to an Xtracycle, with two children ages 5 and 8 riding on it, every day, for two years), and now this part of the hub shell has little cracks going all the way through from the bearing surface to the splines. It looks to me like this “part” might be removable from the hub shell itself, and that a new one could be pressed in. Can anyone confirm or deny this? And, what is the appropriate solution for my customer, other than getting a new wheel? As far as I know, the splined non-drive end of the hub is not available as a separate piece. The “exploded-view” PDF on the Shimano web site does not show the hub shell as being separable into components. The splined coupler appears as if it is made of a different metal than the rest of the shell; it may be pressed in, but still doesn’t seem to be replaceable. Other than replacing the whole hub (the most expedient option), you could look for another Nexus hub with a damaged set of gears. You could swap innards. However, there is as you know a bearing race just inboard of the splined coupler, which must be in good shape. I’d recommend a new hub or a replacement wheel. This might seem like bad news for the customer, but who rode the wheel loose? i like to buy a shimano nexus 8 internal speed that model that weighs 1550 gram. I’m having a Nexus8 problem and can’t seem to find info. Any advice would be appreciated. The hub is only about 2 months old. The other day I shifted from gear 5 to 4, then stood up to accelerate before the shift was complete. It missed and ground and made all sorts of nasty noises, then it hasn’t worked right since. It skips and pops in all gears, and it’s basically unrideable. Cable alignment is good, so that’s not the problem. Something seems to be the matter internally. So, I followed the directions on the Sheldon Brown site for disassembly. I don’t have the special $50 shimano tool, so I couldn’t get it entirely apart, but there were no visible problems with the parts I could see. All of the gears looked good as new. I reassembled and the problem has persisted. Anyone experience something similar? Can internal parts be bought separately and installed? If so, can anyone point me to a resource? I’m loathe to unlace the wheel and try to make a warranty claim. If I can get hold of some replacement parts for <$50 or so, that’d be the ideal route. I’m about to buy a new commuter bike (Giant Expression) which only comes in Nexus-3 and Nexus-7 variants – I would really like it with a Nexus-8-Premium. My plan is to buy the Nexus-3 variant (much cheaper than the N7) and then upgrade the hub. As far as I can tell, all I should need to replace is the hub, roller brake and shifter. There’s also a chance that the spokes may need replacing. Any thoughts? The Nexus-7 is a decent hub. If I were you, I’d get that one and ride it until you need a new hub. If you change the hub, you will also need a new gear changer. @Steve Weeks Thanks for the advice – that’s exactly what I have done. The Nexus-3 route was just too complicated – it’s a different width, different roller-brake, etc. The Nexus-7 is much easier to upgrade to a Nexus-8, but as you suggest I will wait until the Nexus-7 wears out first. Not to be thick, but how did you put your image in the avatar? @Steve – I use Gravatar.com. Just create an account there, upload an image and associate it with your email address. This website checks the email address you enter against Gravatar, and uses the image from there automatically. Only a year later I finally get around to generating an avatar! About the Cesur Bikes Adapter, I only read english and would like to know how much and where to get one. Any beta? Hi all, it is high time to overhaul my nexus hub(s) and I am wondering if it may be possible to somehow rebuild with a quick release axle? This would be nice for my mountain bike, which has vertical dropouts, using an elliptical bottom bracket for chain tension. Also, where can I buy the tools and lubes for this hub? Evan, did you get an answer or solution to your quick release question? I want to attach a child trailer to my nexus 8 and it would be much simpler to swap between bikes if there were a quick release. So any thoughts? None drive side has been laced radial and not sure about the drive side,the Shimano Tech Doc does list spoke lengths but without knowing the ERD of the Shimano rim this information is useless. Has anyone rebuilt one of these wheel assemblies with a DT Swiss rim, and got any spoke sizes or any other information. Ordinarily there would be no problem just using a normal spoke calculator but the hub has the holes spaced with pairs close together seperated by a rather large gap. Thanks for any info it would be appreciated. To do spoke length for paired lacing, (like on the Shimano Nexus wheel you have) just measure the flange diameter/OLD/center to flange as normal, and use a spoke calculator that calculates the length for paired spokes (the effective length changes from conventional crossed lacing). The DT rim ERD is easy to find, it is printed on the sticker of the rim and on the website. Try spocalc for the calculation for paired spokes – it is easy and clear. Hope this helps, happy building. I was unaware there was a calculator that would cope with paired spokes.the hole spacing for the pairs on the hub flange is 8mm and this gives an included angle for the pairs of 11deg the holes in the rim are pitched at 30deg(none drive side and radially spoked) The DT Swiss calculator just looks like the normal equal spaced holes in flange and rim.Trying a bit of trig at the moment but a bit rusty. Thanks for that link,have just downloaded it will check it out later(got some sand coming) and let you know how i got on. Do you know if it is possible to completely disable the coaster brake on a Nexus 7 hub, and if so, how? My wife has one on her town bike and she loathes the coaster brake — it makes it hard to return pedals to a suitable position for setting off, and she also finds herself engaging the brake accidentally. @Peter: Yes, it’s possibile to disable the coaster brake. I had a Nexus 7 and did it without any hint. You have to remove the left cup (that with the brake arm) and carefully extract the brake drum. It consists in two metal half rings, covered with grease (don’t remove it). It worked nice for me. About the Nexus 8 disc adapter from cesur.de…. I sent a couple of emails (in english and german) to the address showed in the Contact page, and never received an answer. I also translated the sit in order to buy the adapter directly from the online store. The bank transfer was made 10 days ago and I’m still waiting for any kind of reply (except the automated one, when you send the buy order). The article was re-added to the items in stock for sale just at the end of February 2009, so I guess there must be some one left! note: I ordered the item to Italy, inside the EU. Cesur.de doesn’t answers to any email. Payment sent on 7 March 2009 for a Nexus 8 disc adapter and until now, 25 March 2009, I received no reply at all. You should remove the links to the website because there is no way to contact them, they doesn’t reply but received the money via bank transfer. the Cesur blog shows activity. I hope I could support you. Thanks Marco, I sent almost 4 emails to the same address you posted, without any kind of reply. On Flickr there’s a profile naed Cesur.de….I sent messages also there, without a bit of consideration. I’m not going to lose my money that way….the blog activity could be totally fake, from my p.o.v. A full month is gone after I posted here. I received replies from http://www.cesur.de and they told me that the material I payed for was in transit 14 days ago, without giving me the traking number of the claimed shipping. After that they just stopped any reply and I received NOTHING. If I didn’t saw the link here now I’ll still have the money in my pocket. I’m just giving them the feedback they deserve. I understand your anger in this case. But please understand that I cannot take over the responsibility for the products and the service of the companies hubstripping.com links to. To be as transperant as possible your comment will advice future possible customers. Hi Marco, today I finally received the loooooong awaited items. If you want you can remove my posts, but the communications and timings were terrible. I suggest to take the items directly from the real store, if you can. I am struggling to get ahold of Shimano 24 spoke rims for a wheel rebuild on my commuter bike (the others are too thin for my 40mm tyres). Do you know if its possible to order only a 32 or 36 spoke Nexus Inter-8 outer casing only, and then swap the internals completely over? I am looking for the Shimano Nexus 7 RapidFire Shifter. I can’t find it anywhere. Is there another thumb shifter that will work for my Shiman Nexus 7 speed hub? I have a Shimano Nexus 8 Red Band Hub on my bicycle. Unfortunately, I have been having an issue with vibration at higher speeds while riding. I put the bike on the bike stand and turned the cranks on the 8th gear at turned them fast and that is when the vibration starts up. It is very noticable. There is no play on the wheel side to side. I even removed the tire, checked that the spokes are tight, and the vibration still seems to be coming straight from the hub. It happens more when the cranks are turning and following to keep up the rear wheel turning. When the wheel is allows to coast, the vibration goes down. Any idead as to why this is the case? 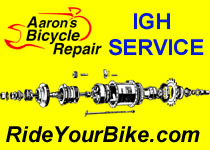 Click on my name at the top of this post to visit the “Geared Hub Bikes Yahoo group which now has 150+ members. Lots of links and info available to members for all makes of geared hubs. Folks, I’d like to equip my recumbent 20″ wheel with a Nexus 8 gear premium and roller brake that I currently use in a 26″ wheel on another bike. By mistake, I bought a 20″ wheel with a Nexus 8 gear COSTER brake which is pretty useless on the recumbent. I’d like to know whether I could just remove the coster stuff from its housing on the 20″ wheel and fill in the premium stuff removed from the housing fit on the 26″ wheel, where I would then fill the coster stuff. So is it possible to exchange the housing of the various Nexus 8 gear brake types? Any answer will be much appreciated. I am interested in your 8C20 hub if it is reasonable. Drop me a note oar8@att.net. I’ve been looking for this information for ages! I will definitely fix my bike this week! I got a SG-8R20 off eBay and built a wheel from it. It would make a grinding noise in 4, 5 gear while under load but runs fine down shifting from 8 to 7 to 6.. etc. Is this related to needing lubrication or this hub is worn out? Hi anyone know if i could use my NOS shimano nexus inter- 4 speed with coaster brake as a freewheel? that is could i remove the coaster parts and use it safely? Did you ever get a reply as I want to do that. My new (May 2009) r-m Delite city bike has an SG-8R25 igh – works fine! BUT: Sometimes, I notice slippage between gears without me having worked the shifter… 😦 It’s usually between the lower gears 2-4, and not in the higher gears (say, 6-8). Has anyone else noticed this? I have gone through and adjusted the two yellow marks in the tiny window thingy, so I think I’ve correctly adjusted eveyrthign that can be – but after just a few kilometres, the slippage starts again. Oh, and i also have to re-adjust the two yellow marks. My new (May 2009) r-m Delite city bike has an SG-8R25 igh – works fine! BUT: Sometimes, I notice slippage between gears without me having worked the shifter… 😦 It’s usually between the lower gears 2-4, and not in the higher gears (say, 6-8). Has anyone else noticed this? I have gone through and adjusted the two yellow marks in the tiny window thingy, so I think I’ve correctly adjusted everything that can be – but after just a few kilometres, the slippage starts again. Oh, and i also have to re-adjust the two yellow marks. A possible way to fit 7-8 gear hubs in frames made for older 3-speed hubs and single speed chains with too narrow forks was revealed on a recently acquired bike: mount the hub between the outside surfaces of the fork using a mending plate bolted to the fork and drilled for the axle (as well as for any non-turn washers), possibly drilling holes in the fork for the plate (substantial bolt size is required for the load, but must not take out too much fork material). Another 6mm on each side can be had depending on fork material. Can be done on one side only as well, with adjustment of the wheel build dishing. There is often a locknut on the ends of the hub shaft which will fit between the forks etc. There can still be room for the ring type shifter inside the forks. Details are left to the expert mechanics — just a possibility. While out riding my gear ratios changed from 1st to 8th gear. I stopped and ran the gear shifer back and forth. It seems to change the gear ratio when I do this. Doesn’t seem as if the gears have gotten back to the original ratio….. Is there a system in the Shimano 8 speed internal that allows for the changing of gear ratio’s by swithing the shifer while sitting still?? I have a used bike w/ the Inter8 hub, and was getting grinding noises and slippage in the 5-6. I disassembled the hub and found rust on the roller bearings that encircle the carrier unit. I cleaned that up and greased the whole thing with Nexus grease and reassembled it. Now the only thing that is working when I shift is the clutch. That is, gears 1-4 are one speed, and gears 5-8 are another speed. I’ve, sadly, coverted the thing to a two-speed hub. Anything come to mind as a cause for this? happens the same to me. I disassambled it again and again and again until it works perfectly. You need a lot of time laerning who this machine works. But after it, you will never have the trouble again. The rust comes from wrong building of the hub. Don’t forget the explosion drawing of the hub. Without wont work! Thanks for the feedback. I’ve disassembled and reassembled the hub. It’s still a 2-speed. One thing that is not clear to me is the function of the internal tooth on the carrier unit. On the hub I’m working on, the internal tooth is free to rotate. Is it supposed to be able to rotate like this? I’m thinking that it should not be able to rotate freely. Input?? I think the problem you have was in the calibration on the hub. So you don’t need to rebuild the whole hub. anyone have a instruction for assembly of the hub axle unit on a shimano nexus 8 hub?? Shimano has announced a new 11 speed hub with a 409% range, the SG-S700. Just announced and with few details other than using oil bath lubrication like the Rohloff and with very even steps between gear ratios. Estimated price is about 300 Euros. I’ve just received a 32 hole Alfine shell from a mechanic friend (apparently the hub had been used in extreme mountain biking situations and had died from water ingress). I’m wondering if it’s possible to fit nexus 8 internals into this shell, as I want to run it with a disc brake? Has anyone try converting the Nexus 8 to fixed (disable coasting)? I have done the “dip” service on 2 Nexus 8-speed hubs. A “Red Band” (8R25) hub is now in service and performs well. A check at 300 miles was uneventful. A regular (8R20) hub with about 2,000 miles on it is waitingfor inspection, but has worked well through the last 2 winters. Report to follow. It’s in German – it basically says that the new white grease is better than the black grease and it tells you how to apply the grease when doing maintenance. The Nexus hub I performed the “dip” on about 2,000 miles ago was fine inside. There were a few metal flakes in the ATF after settling, but the gears looked barely worn. The bearing races were in perfect shape. PLEASE someone help me! I have a premium 8 hub on a Breezer uptown 8. I bought a 16t cog(correct, dished) from Harris Cyclery, and gave it to my Local Bike Shop for install. They said that it wouldn’t fit/ rubbed or pressed against theshifting unit… How can I fix, rig, change or add spacers/washers to make this work? I really want the 16t on! HELP! Thank You! I’ve only seen ‘rubbing’ when someone used a normal circlip in place of the shimano supplied split ring to hold the cog on. worst on 5. Also feels sticky. Invested in special tools and dismantled hub. couple of bits. Was confident in reassembly. some auto-changing and more clicking. possible that these are somehow malfunctioning. and it will not sell for as much as it costs to fix. have been part way there. would be implicated in symptoms described? that 5-8 make use of “Kupplung” or clutch? That was the spring and widget thingy. to actually go wrong. Maybe I was wrong. Mike, several years ago I took apart a Nexus 7-speed that had water ingress and bearing damage; I had nothing to lose, in other words. I took apart the hub axle unit and was never able to get the hub to shift properly (bench-mounted). Now I have two 8-speed Nexi (Winter/Summer switch) and I dip the insides in automatic transmission fluid once a year. I put some of the Nexus grease (black version) on the ball bearings for some unknown reason. The bearings don’t seem to wear from year to year. I’ve taken the planetary gear “modules” off the hub axle unit, which can be done without any special tools, AFAIK, and have had no trouble replacing them. Is it possible that when you degreased the hub you flushed lubricant out of the hub axle unit and the new grease never got in? I don’t know how sensitive these hubs are to lubrication, but an ATF dip might be worth a try. Also, be sure the shift cable is free-sliding in its sheath. Disconnect it from the hub and pull on the free end gently as you move the gear selector through its range. If the cable hesitates or resists your pulling on it, the cable may have corrosion or other source of friction in it. Obviously, the cure is to replace the shift cable and housing. I have found the Nexus 8 to be very reliable, and the infrequent shifting problems I have had have *always* turned out to be cable adjustment or deterioration issues. Just looked at your post again, Mike. You said the problem occurred soon after a rear flat repair. This makes me think it’s a cable adjustment issue or that perhaps you inadvertently crimped, kinked or otherwise damaged your shift cable. This would be consistent with a “delayed” feeling. Also if you mainly have the problem going from higher to lower gears (when the hub’s internal spring has to pull the cable through the high-resistance area), this hypothesis would be supported. the lever are smooth and progressive and the problem applies on going up through the gears as well as down. If I’m reading you right, you have removed the “carrier unit and ring gear assembly” but not taken the next step of removing the “drive side cone” and clutch gubbins which requires the special tools on the inter-8. Did you go further with the 7-speed? I did that next step and a bit more and am thinking about going further. I wanted to get at that drive side bearing for greasing. I suppose that is irrelevant if you go for the oil approach. I should photograph it all and post up my results. I’ve got a Nexus 8 hub on a bike recumbent bike I bought a few months ago. Lately the shifting is “sluggish” It can take several seconds after changing gears before I feel it click up or down. Sometimes in the lower gears, it won’t drop down at all especially under load when riding up an incline. I’m fairly certain the cable is adjusted correctly. I don’t know when/if this hub has been oiled and that is a job I’m afraid to take on by myself. Is it worth hiring the local shop to lubricate this hub, or do these symptoms indicate that the internal gears are already shot? This is my first time using an internal hub and while in general I love it, its a bit frustrating not being able to “see” what is wrong when it doesn’t work correctly. Internally-geared hubs are generally quite durable, so I doubt the hub is shot. It sounds like a cable problem to me (sorry to sound like a broken record if you’ve read my previous posts), especially if the problem is more prominent when you are down-shifting. A sticky, corroded or kinked cable would cause this kind of behavior. A new hub should not require lubrication after a few months (well, depending on miles ridden, I guess) unless water could have gotten inside. Probably not a bad idea to let a shop look at it if you can’t find a problem with the cable. Once off the bike, the old cable had quite a bit of resistance to sliding; no rust on the cable itself, but a few cracks and kinks in the housing. Probably should have changed it sooner. i wanted to buy shemano internal gear hub,3,4,7,8 here in the philippines.but i have no idea where to buy here and also the prices of this hub.i need an information pls?thanks! does anybody have an idea how to put an hub axle unit back together? I have a SG-8R20. I removed the core and soaked it in transmission fluid for a day. Reassembled the hub and now it doesn’t rotate forward in gears 5-6-7-8. Gears 1-2-3-4 works fine. Before the soaking, it slips in gear 4-5. What did I do wrong? Anyone have any decent information on stripping a Nexus Inter-7? I found the Shimano technical documentation and the following YouTube video http://www.youtube.com/watch?v=SEfTlszXUFo by a polish bike mechanic but it’s fast and has no commentary. I’d like to find a step by step with instructions. Any ideas? Very good blog you have here but I was wanting to know if you knew of any forums that cover the same topics discussed here? I’d really like to be a part of community where I can get feed-back from other experienced people that share the same interest. If you have any suggestions, please let me know. Thank you! I lost the stupid metal band that’s supposed to attach the reaction arm of the coaster brake version of this hub to the chain stay. Any idea where I could pick up a replacement? What else could I use in its place? Just saw this. I have equipped both my folding bikes with roller brakes to replace the rim brakes that eventually wore out the rim sidewalls. These bikes have Nexus hubs. I made the strap to secure the torque arm out of a stainless steel hose clamp. It’s a good, though tough-to-drill, material. The clamps are readily available and cheap. Thanks for shimano sram 7 guide. Found it almost impossible to mount the cassette back on after replacing the back tyre, until guided that ALL the yellow dots have to match.thanks. Hi, I have a question about my new SG-8R31. I read here about how to improve waterproofing, so I removed the sprocket and dust cap to put some grease behind it. But when I put the dust cap on again, it doesn’t seem to seat fully. There is a small gap (about 0.5mm) between the hub body and the dust cap lip. I thought that this lip must contact the hub body, but there’s no way. I even tapped lightly the dust cap with a rubber mallet, but it won’t go further. Could this cause any problems? Thanks. Self reply: I’ve checked it out already, it’s OK.
Somebody essentially help to make significantly articles I would state. That is the very first time I frequented your web page and so far? I amazed with the analysis you made to make this actual publish amazing. Great task! – when reassembling the internal unit – the position and synchronisation of the 3-step planet gears (http://www.hubstripping.com/shimano-alfine/alfine-strip/slides/DSCF2923.html) is very important. You need to synchronize them until the outer ‘ring’ gear fits easily over the planet gears. – If you need to use force, it’s probably incorrectly assembled. Everything should fit easily without much force. My hub is in good shape. After I bought it I applied about 10ml Automatic Transmission Fluid (Dexron III specs). This maintenenace was after about 600km. I cleaned everything from the original grease and applied new grease + again about 10ml ATF. I use a thicker grease for the cup and cone bearings, to serve as a sealant to prevent the ATF from leaking. No leaks detected so far (including the first 600km). I have a SG-8R31 hub that has a problem with the roller clutch failing to catch when I start to pedal in 5th gear. It does not always happen, and when it does the hub will engage after a half turn of the crank. The other gears do not have this problem. Once the roller clutch is engaged it will not slip as long as it is under load, but sometimes it will disengage between pedal strokes. This has been an issue since I got the hub, but it seems to be getting worse. will work with the dropout, and adjusted the cone tension. spring has more than enough force. had been constant with both CJs, shifters, and cable housing set ups. grease on the inside of the hub shell and the bearings. Six months later I did the same thing. the small one next to the non-drive axle. somehow contaminated the roller clutch and caused it to slip. get a new hub for about $200. I have found another intresting article about the assembling and reassembling from an Nexus 7 hub. thrills of a sheer drop. For Sony buffs, you’ll be free to discover this beautiful city. I have created a page on how to reassemble the axle unit. to shed water. It won’t take you extremely long to work out what way to employ it. You can make corrections directly instead of having to search mistake through the code, if something does not seem OK for you. unless you can cleverly manipulate the mechanics behind its operation, but that is highly unlikely. paragraph and once or twice in the main body. It’s a good idea to have separate email promotions for prospects and customers, too, because you typically need to send different information to the different groups. Html form builder renders efficient service to online business companies to create any sort of online form to integrate it into their website and receive incoming information from online visitors. Hello there – wonder if anyone might be able to help me with a Nexus 8 problem on my Gazelle Toer Populaire – a traditionally styled Dutch bike which I’m otherwise delighted with…? I’m in the UK by the way. Been on a couple of testrides looking out for the skipping which always occurs when I’m not expecting it – when I try to make it skip – it’s fine. After about a month of ownership during which the bike was fine, I thought I would check the adjustment having heard that this is particularly important with the Nexus. In addition, if I got a rear puncture, it would be something I would have had to do anyway. Given that the Gazelle has a full chaincase of fabric fitted over a metal frame and the adjustment is hidden from view, this isn’t that easy a task – well, not the first few times anyway. I found that it was WAY out! and tried to adjust it accordingly. I had to move the cable pinch bolt to near the end of the cable before the barrel adjuster would line the two lines up. I also had to take apart the grip shifter because the cable seized in the barrel adjuster. It is adjusted correctly as far as I can see – two green lines lined up. You can shift the gears up and down the full range (like the dealer told me to) and the adjustment stays put. The bike is less than 3 months old. I’ve since spoken to the dealer (an official Gazelle dealer) who would like to see it but he is 50 miles away and I would have to take it on the train – actually 2 or 3 trains. Something I would like to avoid. Meanwhile, I am going to take photos and email them to him. The dealer told me if out of adjustment, it would skip in 3rd or 4th and it has nothing to do with the length of the cable or positioning of the pinch bolt. Also, apparently, the bike “settles in” after about 3-6 months of regular riding or so. The adjustment of the gears is set at the factory not him. I can only assume that it left the factory incorrectly adjusted. Any ideas? Was it my fault…? I cannot see what else I could have done under the circumstances. I have experienced the same skipping with my Nexus 8, but this was because there was a ball bearing missing in one of the internal bearing rings. However, if you don’t get a good answer on this page, I suggest you join the Yahoo group (http://groups.yahoo.com/neo/groups/Geared_hub_bikes/info) as there are several people there who know the Nexus hubs in great detail. Sadly, Sheldon Brown isn’t there… but his spirit lives on, I believe. A missing ball bearing would NOT cause skipping. The only thing that can cause a Shimano Nexus/Alfine hub to skip is a worn axle pawl (very rare) but far more likely a sticky cable/housing. If the pawl does not lift all the way off the axle to engage a sun gear ratchet ring, then it can skip forward to the next notch. This will feel like a sudden clunk in the pedals. A new housing, cable and metal ferrules will usually fix the problem. Loose and dry axle nuts can also cause shifting problems. Make sure the axle nuts are greased and torqued to 35 foot-pounds. (sorry, American here, did not learn to think in Newton-meters, but that is what Google is for, right?!). hi, i am a hungarian hobbyist who loves IGH’s especially shimano nexus 7 and 8 hubs. i have seen many of IGH’s, old ones, new ones, english, german, japanees, austrian etc. its a daily routine to work with them for services and private bike owners. i have hubs for sale as well, all like new, shipping is possible worldwide. i also repair them, wheels or simply internal mechanisms are welcome for repair, cleaning or simply cheching and re-greasing. i have a website here translated into english, but dutch, german speakers are also welcome. http://gearhubservice.blog.hu/. i have lot of new and used spare parts, if you are interested, if you have a question, if you have problem with your gear hub, contact me via email: szegedretrokerekpar et gmail dot com, we discuss prices and conditions. Drum brake, coaster brake, without brake, rollerbrake, all are welcome.